The Butte County Sheriff’s Office says more than 560 names remain on the missing list. People who lost their homes in the deadly fire that destroyed Paradise are filling their plates with turkey and pie at a community Thanksgiving meal. Patty Rough says she and her husband Chuck would normally host their family at their home in Paradise. But on Thursday, she instead gathered her son, daughter, future son-in-law and two grandchildren at California State University, Chico, where 15,000 meals were being served. Eduardo Garcia was also enjoying a warm meal. The construction worker says he helped build the campus auditorium where the meals were provided. Rain is hampering teams searching for remains of people in rubble left by the devastating fire that destroyed Paradise. His team has 27 people involved in the effort. Ventura says the rain “clumps things together” while making the terrain soggy and harder for workers to see and move. Ventura says the workers are soaking wet and trying to keep their socks dry to avoid hypothermia. The Orange County team is one of eight FEMA response teams in California that assists with disaster recovery. Fire officials say rain is helping the fight against the deadliest blaze in California in the past century. The California Department of Forestry and Fire Protection said Thursday the fire that leveled Paradise is 90 percent contained two weeks after it started. 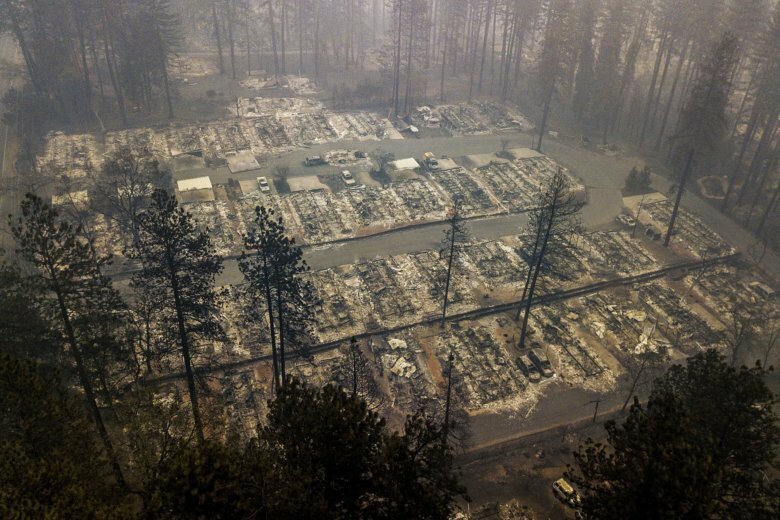 The blaze was 80 percent contained Wednesday before the first of three storm systems arrived in the area where at least 83 people died in the fire. The first storm has moved on and another is expected later Thursday, raising concerns about mudslides and other problems. Butte County Sheriff Kory Honea says more than 800 people will search the rubble for human remains on Thanksgiving. Thousands of people displaced by the blaze will spend the holiday with family in the area or with strangers who open their homes for dinners put together by nonprofit groups. Thousands of residents who lost their homes or their loved ones in a Northern California wildfire will spend Thanksgiving in unexpected situations and with unfamiliar faces. The nonprofit World Central Kitchen is teaming up with businesses near the town of Paradise to provide 15,000 meals Thursday. And scores of people are opening their homes to share dinner with strangers who lost everything. Others who fled the deadly wildfire are spending the holiday with family nearby. The fire ignited Nov. 8 and devastated Paradise and surrounding communities. It has killed at least 83 people and destroyed more than 13,000 homes. Thousands of people remain evacuated.